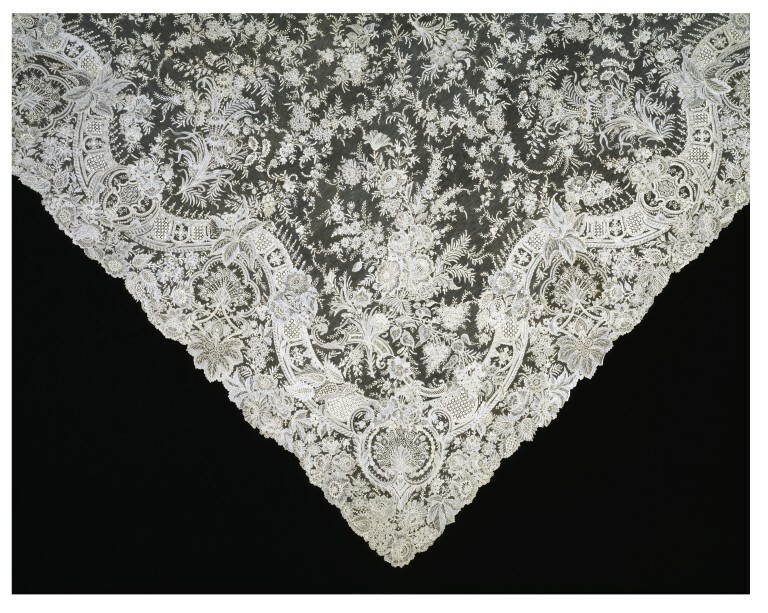 Fashion trends affected the market for quality hand-made lace in the later 19th century. It became increasingly popular once again in the later 1880s, and it experienced a boom in the 1890s and 1900s, peaking between 1895 and 1905. Point de gaze needle lace was the most fashionable type, and fine pieces were made for exhibitions or special commissions. This veil was worn by Roxana Atwater Wentworth (1854-1935), daughter of a former Chicago mayor, for her wedding to Clarence Winthrop Bowen (b.1852) on 28 January 1892. It was said by the family to have been exhibited at the World's Columbian Exposition, held in Chicago, U.S.A., in 1893.The veil was also worn by Roxana Wentworth Bowen, their daughter, when she married in 1917. Wedding veil of high quality Point de Gaze needle lace with a hand-made réseau, fine shading effects and a large variety of decorative filling stitches. In the centre of the veil is a bouquet of flowers enclosed by an eight-point star composed of floral garlands. Further sprays fill the points of the star and also the ground between the centre-piece and the elaborate border. At each corner are larger elaborate, densely worked sprays which extend to the centre of the veil. The border is formed by a solid, serpentine line, broken at intervals by sprays of flowers and by elaborately-patterned cartouches. The filling stitches used are clear-cut, solidly-worked and very varied. The effect of the border is three-dimensional and architectural. The area between the serpentine line and the scalloped edge is filled with naturalistic flower forms. This veil was worn by Roxana Atwater Wentworth (1854-1935), daughter of a former Chicago mayor, forher wedding to Clarence Winthrop Bowen (b.1852) on 28 January 1892. It was said by the family to have been exhibited at the World's Columbian Exposition, held in Chicago, U.S.A., in 1893.The veil was also worn by Roxana Wentworth Bowen, their daughter, when she married in 1917. 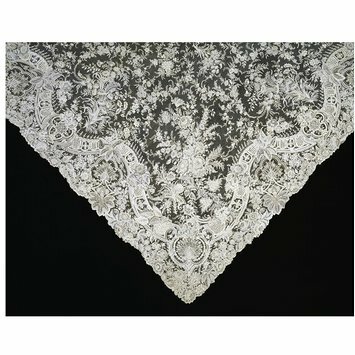 Veil of point de gaze needle lace, Brussels, 1890-1. 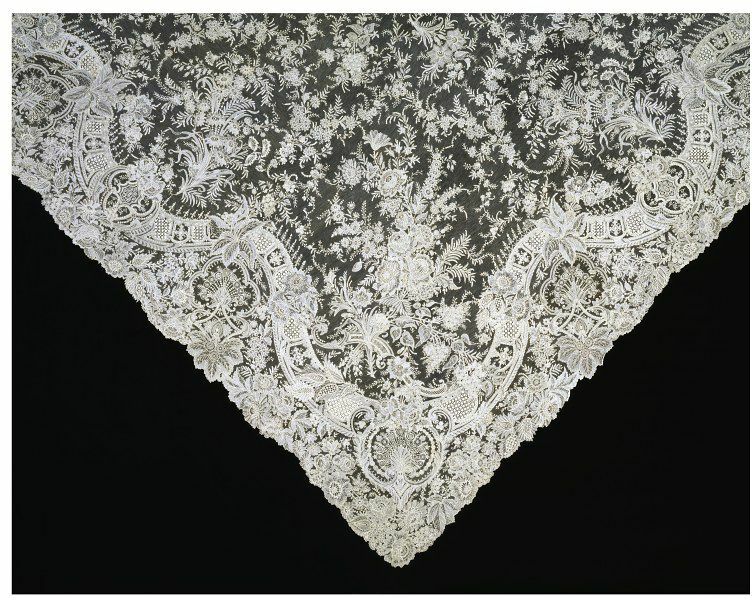 High-quality lace was prized in the second half of the 19th century and the best examples were often exhibited. Following Roxana Atwater Wentworth's wedding to Clarence Winthrop Bowen in Chicago in 1892, her magnificent wedding veil was exhibited at the Chicago World's Fair in 1893.